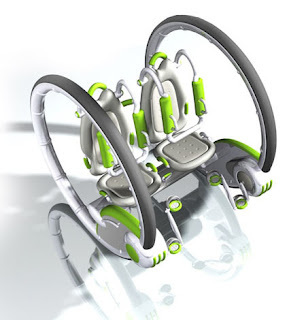 Cojoy Bicycle Concept - An Inspiration Of Dual Paddle Boat ! 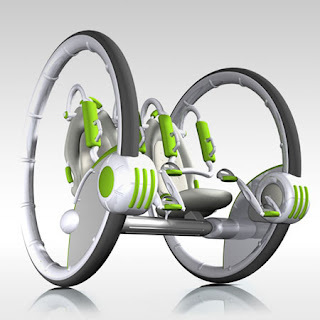 This is a new bicycle concept inspired by the dual paddle boat along with an operational wheelchair. The name of the new bicycle concept is Cojoy especially has been designed by Pengtao Yu for offering sheer fun for the bicycle riders. Each rider of the concept can control one wheel separately. Moreover, the seat concept of the concept is totally adjustable using the handle, so that riders can adjust it as they need. If you want to go straight both of the riders have to pedal at the same speed, when you want to turn, the outer rider has to pedal faster than the inner rider. If you are going to ride this bicycle means both of the riders have to have good communication, cooperation and a minimum skill.